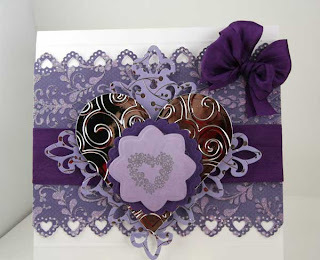 This Valentine card has been designed using the new Kaiser Paper Pad called Lilac. It is hard to see the foil flecks in the paper, but IRL it is stunning. First the CP was cut about 1 1/2 inches less than the 6x6 Neenah Card Stock. The Valentine Heart punch was used on both the top and the bottom. I ran a strip of dark purple silk ribbon underneath the paper before gluing it down. This ribbon added a nice contrast. A coordinating paper in the Lilac Paper Pad was use for the Fleur Di Lis Spellbinder die. The Spellbinder Nestie made a gorgeous heart using the Silver Paper (shown below) and then it was embossed with the Cuttlebug Embossing Folder. The Favorite Occasions Stamp set by JustRite has this adorable little heart so I stamped it with a silver ink pad onto the Dahlia Nesties by Spellbinders. Then it was bordered with dark purple paper which was cut with the Peony Nestie. I have listed all the items for sale below this post. The items I list in previous posts are also available. If my stock has been depleted, I will be glad to reorder it for you. A beautiful card Joan. Gosh, I can't believe Valentine's is around the corner already! Joan told me yesterday that she needed to go get creative and did she ever. This card is over the top! I love the colors and the way it all came together so beautifully. Way to start the new year Joan! Joan, Your card is stunning! I love the gorgeous colors you used! Thanks for sharing!